Do you want to create an ISO image file from a DVD disc? Or, need to get a DVD ISO backup of your precious DVD disc onto computer hard drive so you could preserve your DVD content safely in case the original DVD disc is damaged or lost? If you have such DVD to ISO copy need, you’ll get satisfied solutions here. An ISO file, often known as ISO image file, is a single image of an optical disc of CD, DVD and Blu-ray. As optical disc image file, ISO image file includes entire content of source disc. While discs are fragile and not convenient for long-term safekeeping, ISO image files help save disc content in a safer way. Read the content below to learn how to copy DVD to ISO image file and other ISO related solutions. ISO image is a term commonly associated with CD, DVD and Blu-ray burning. An ISO image file can contain the entire contents of a CD-ROM disc or CD medium. ISO files are typically created through a software application that will open, create, edit, and extract CD or DVD image files, then convert the extracted image to an ISO file, for allowing users to burn an exact copy of the original onto CD or DVD. To copy DVD to ISO image file (or rip DVD to ISO or burn DVD to ISO), you need to make use of 3rd-party DVD to ISO copy software apps. The below content lists you 5 best DVD to ISO copy software apps. Free DVD ISO Maker is an easy to use ISO maker. It can make ISO image from both data DVD/CD and audio DVD disc. 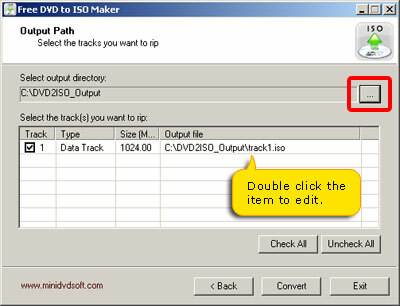 With Free DVD ISO Maker, you can easily rip DVD to ISO image to backup DVD/CD on your hard disk or other storage devices. 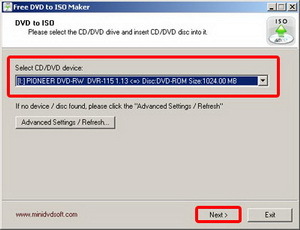 1) Start Free DVD ISO Maker, insert a CD/DVD disc and select the CD/DVD device. Click “Next” button to continue. 2) Click “…” button to choose the output directory. And select the tracks you want to rip. 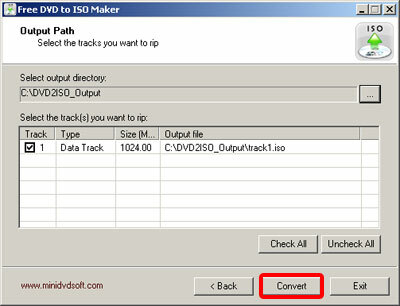 3) Click “Convert” button to make ISO image from DVD/CD. Note: It should be noted that Free DVD to ISO Maker supports data CD/DVD and audio DVD only, but not video DVD. Therefore, if you want to copy video DVD to ISO image file, this DVD to ISO burner is not suitable. The best DVD to ISO copy software should get these features: bypass encrypted DVD discs, support both DVD disc to ISO image file backup and ISO to DVD disc backup, copy DVD to ISO without any quality loss, easy to use and available in both Windows and Mac. Of course, the price is also an important element. 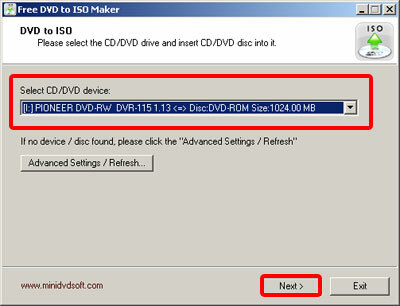 Free DVD ISO Maker is wonderful, but not the best DVD to ISO burner to burn DVD to ISO image file since it firstly doesn’t support video DVD, and secondly it is not available in Mac. Therefore, Leawo DVD Copy is the best DVD to ISO copy software to help you easily copy, burn and rip DVD to ISO image file. Leawo DVD Copy – The ever best DVD to ISO backup software for PC/Mac users to rip, copy and burn DVD disc to ISO image file on PC or Mac computer in only a few simple clicks. 1. Decrypt any protected DVD disc and remove region code for DVD to ISO copy. 2. 1:1 disc to disc duplication. Copy DVD to ISO image file without quality loss. 3. Copy and burn ISO image file to DVD disc in one click. 4. Extremely easy to use interface for both novices and veteran. Then, you need to download and install Leawo DVD Copy on your computer via the download links provided above. The Windows version of Leawo DVD Copy could run on Windows Vista and later, while Leawo DVD Copy for Mac runs on Mac OS X 10.6 and later. Download and set it up according to your computer system. 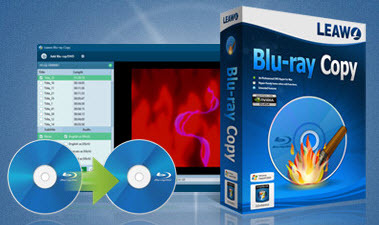 Follow the below steps to learn how to copy DVD to ISO with Leawo DVD Copy (both Windows and Mac versions share the same interface and DVD to ISO copy operation). Insert DVD disc into the drive and then launch Leawo DVD Copy. Click the “Add Blu-ray/DVD” button to import source DVD movies from disc drive. If you want to copy DVD folder to ISO image file, choose source DVD folder from your computer to drag and drop into this program. Click the drop-down box at the bottom left corner and then select a target DVD disc type (DVD-9 or DVD-5) to set as ISO image file dsic type for future ISO to disc burning. After that, select a copy mode from Full Movie, Main Movie and Custom Mode. If you want 1:1 disc duplication, just select “Full Movie” mode. Click the big green “Copy” button. Since you need to copy DVD to ISO, choose “ISO File” option under “Copy to” to burn DVD to ISO image file. Set an directory in “Save to” option to save output ISO image file. Customize “Disc Label” if you like. Click “Copy” button to start copying DVD to ISO image file with Leawo DVD Copy. There are various ways in which you could get ISO image file. 1. 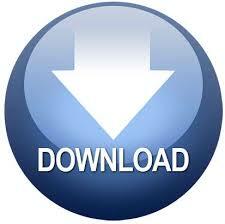 Download ISO image files from online stores, especially those system ISO image file and games like Windows 8 ISO image. 2. Create ISO image file from Blu-ray, DVD or CD discs with the help of Blu-ray/DVD Copy tool, mentioned above. 3. Create ISO image file from files or folders by making use of ISO burner like Blu-ray ISO Creator. 4. Create ISO image file by making use of WinRar to freely generate files or folders into ISO image file. ISO image files could be openned or used in multiple ways upon personal needs. The most common using of ISO image file is to burn ISO to DVD/Blu-ray/CD discs. However, you could still use ISO image file in other ways. Check below ways to learn how to use ISO image file freely. 1. 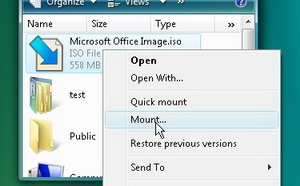 Mount/dismount ISO image file to open ISO image file in File Explorer. 2. Burn ISO image file to DVD/Blu-ray/CD disc with ISO Burner software. 3. Play back ISO image file directly with Free ISO player.